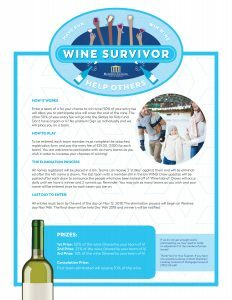 Our Wine Survivor for 2018 is over, check back September 2019 for details on next year! 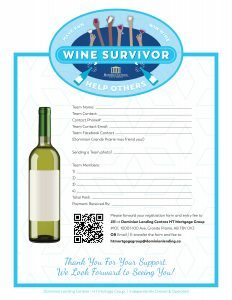 Grande Prairie Dominion Wine Survivor – Fundraising to give kids skates! Enter a team of 4 for your chance to win wine! 50% of your entry fee will allow you to participate plus will cover the cost of the wine. The other 50% of your entry fee will go into the Skates for Kids fund. Don’t have a team or 4? No problem! Sign up individually and we will place you on a team. To be entered, each team member must complete the attached registration form and pay the entry fee of $25.00. ($100 for each team). You are welcome to participate with as many teams as you wish in order to increase your chances of winning! All names registered will be placed in a bin. Teams can receive 3 “strikes” against them and will be eliminated after the 4th name is drawn. The last team with a member still in the bin WINS! Draw updates will be posted after each draw to announce the people who have been kicked off of “Wine Island”. Draws will occur daily until we have a winner and 2 runners up. Reminder: You may join as many teams as you wish and your name will be entered once for each team you are on. 1st Place get’s 50% of the Wine! Consolation Prize: First Team out of the Running get’s 10% of the Wine! All entries must be in by the end of the day on Nov 12, 2018. The elimination process will begin on Wednesday Nov 14th. The final draw will be held Dec 14th 2018 and winner’s will be notified as we go!